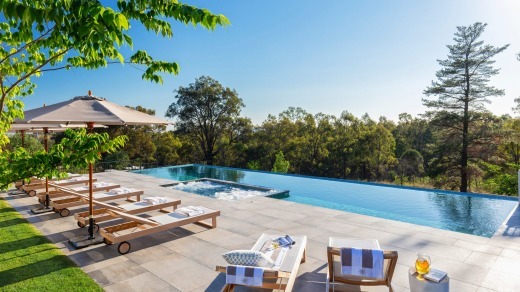 Luxurious Spicers Guesthouse in the Hunter Valley. There's a certain elegance about the kangaroos that stand watch outside reception and mooch around the firepit at the newly-opened Spicers Guesthouse in the Hunter Valley. But these are no ordinary roos and this is no ordinary property. The Cor-ten steel kangaroos are the work of Victorian artist Matt Hill and they help frame the stunning views at the former Peppers resort. 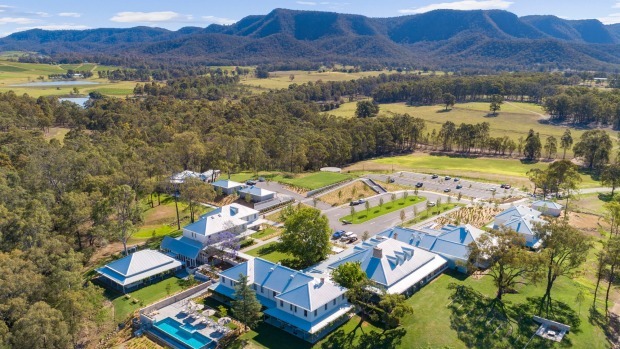 The Guesthouse has all the trademark style and substance of the eight other properties in the Spicers stable after a stunning $30 million renovation which has transformed the 1980s property in Pokolbin, the heart of this historic wine country. This understated luxury is evident in all of the distinct spaces, from the snug lounge with sandstone fireplace, the long bar, the terrace with sweeping views of green pastures and dam, the triangular wine wall featuring local growers' top picks, and the private dining room crowned by a stunning branch light feature. The new infinity pool appears to fall gently into the postcard-view beyond, and is spectacular under a star-speckled sky. The 46 contemporary guest rooms are in muted tones designed to reflect the local landscape. The new infinity pool at Spicers Guesthouse. To cap it off, eRemo Restaurant, features the talents of multi-hatted executive chef Cameron Matthews, who has forged a name with his modern Italian dishes. The menu choice flying out the door is the chef's selection of dishes served share style for $80 a person. Highlights? Roasted octopus, spicy nduja with romesco sauce and Zabaglione parfait, stewed apple, almond crumble. The pool, fire-pit and mountain views make this an escape for all seasons, though an abundance of new plantings promise a spectacular spring. This is the second Spicers foray into Australia's oldest wine region – they also run Spicers Vineyard Estate. Bed and breakfast from $329 in a king room midweek; $379 per weekend.